Let's get started with acrylic painting basics. 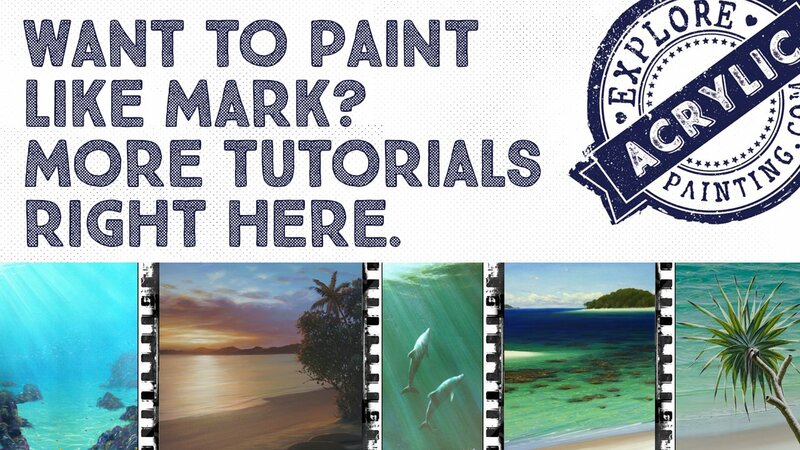 Have you always wanted to explore your potential for acrylic painting? Or are you new to the medium?. Explore all you need to know (and some things you don't!) about acrylic painting basics right here. Because this page is about acrylic painting basics, we haven't mentioned a variety of other tools, such as palette knives, spray bottles, etc. The painting instructions included here are purely designed for you to create a basic acrylic painting (or not, if you are very clever!). Your palette holds your paint and is a very important tool in keeping your colors organised. To this end I recommend using a large palette! I use a large, flat piece of timber, ply or MDF, or you can use whatever (reasonably) non-porous material you have lying around the house, at least 70cm x 50cm. This allows you to mix up as much paint as you need, without having to stop in the middle of your "zone" and deal with practicalities. Being set up as well as possible at the beginning, means you spend more time painting, and less time getting in your own way! Your easel holds your painting surface. This is certainly a matter of preference. Depending on your subject matter, size of your image and your approach to painting (if you jump around like a maniac with a large 12 inch paintbrush on a huge canvas, a flimsy easel will not work!). You may choose to use a large upright easel, a portable easel or a tabletop easel. You may want to lay your canvas on the floor, or attach it to a wall. Try out some different scenarios and see how your creativity develops with each one. 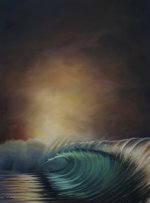 As you progress from mastering the acrylic painting basics to a deeper skill level, you will discover what works best for you. I've recently been working with my large paintings laid flat on a low table. Keep it simple! Limit your brushes. Push them until you know exactly what each one will do. I use a maximum of 5 brushes, all cheap hog hair chisels. Sizes range from a 2 to a 12, and one large house brush of approximately 10cm. As a general rule, use the larger brushes for painting large areas, and the smaller brushes for finer detail. You can spend a fortune setting yourself up with acrylic painting basics. You don't need to. Acrylic paints can be hard on brushes (as am I!) so it doesn't really make sense to me to spend a lot. As always, experiment and chuck some paint around. Really find out what your paintbrushes will do. Your painting surface can be anything from pre-primed & stretched canvas, to an old piece of masonite (you will need to seal it first); watercolor paper to 3 dimensional items. The only limit is your imagination. Your surface will need to be "primed", or made ready for painting with acrylics. 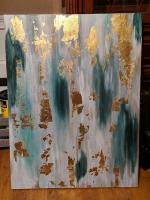 You will need to cover it with acrylic gesso or equivalent so that the paint will stick. Obviously there are many ways to explore basic acrylic painting. For beginners, you may choose to purchase student quality acrylics, which are usually cheaper; and the pigments tend not to last as long. Chroma have made their student quality acrylics (Chromacryl), similar in consistency and strength, to their artist quality products. Most artist quality acrylics are fantastic, especially when you take the time to get to "know" them. Spend as much as you can afford on the best quality paint to get you started. 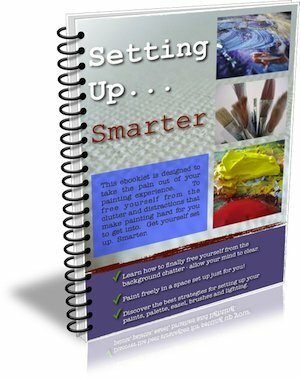 You will master acrylic painting basics in no time! Most of us know from our early days that we can make almost any colour we want from the three primaries, red, yellow and blue; plus white and black. I would like to elaborate on that and suggest that initially, you get a warm and a cool version of each primary (and throw your black in the bin). Almost any colours you need to make can be created out of these. See the color mixing page for information on mixing colors. Ok, so you have gathered your tools, materials and colors. You may have an idea of what you want to create, or you may have no idea. Inspiration can come to you at any time. An idea, a moment, long shadows, an interesting shape. Grab whatever it is that speaks to you. Photograph it, sketch it, write about it; record it somehow. Then get to your workspace and start fleshing it out. Decide on the style of painting you want to explore. Perhaps your subject warrants an abstract approach, or impressionist, or even surrealist. All of these styles are explored in more detail on this site. Hopefully this page has inspired you to explore your capabilities with the acrylic painting basics. Always remember - experiment, experiment, experiment! No one will die. The first 3 pages are FREE! !